What do I have to say about Baked Alaska? 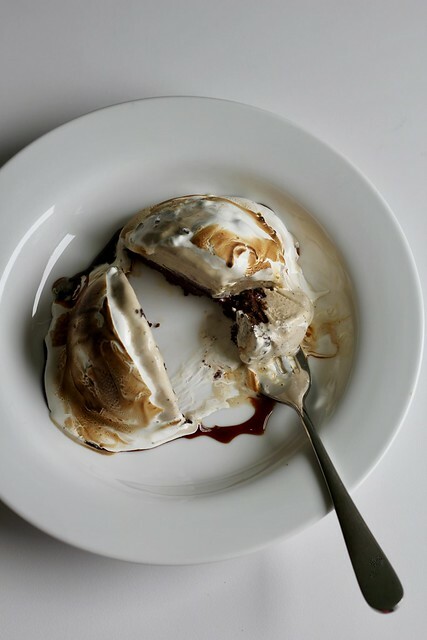 Cake & ice cream & meringue…really, do I need to say more? I think not, but I will say just enough to tell you that the cake here is a flourless chocolate souffléd brownie-type thing, and while the ice cream could have been any kind, I chose coffee. Those two flavors are a match that can only be made better with swirls of sticky meringue. I made individual-sized Alaskas, rather than a large one, so I was a little concerned about browning the meringue in the oven. I thought they might be too delicate for that, so I used my blowtorch instead…which is more fun anyway…maybe next time I’ll try setting it on fire. I agree what’s not to like with baked Alaska. Your individual versions look cute. Love your individual Alaskas. If I had moults small enough I would have done that too as it was just for me. Yours is perfect! Love the pattern from the torch! These look really good! 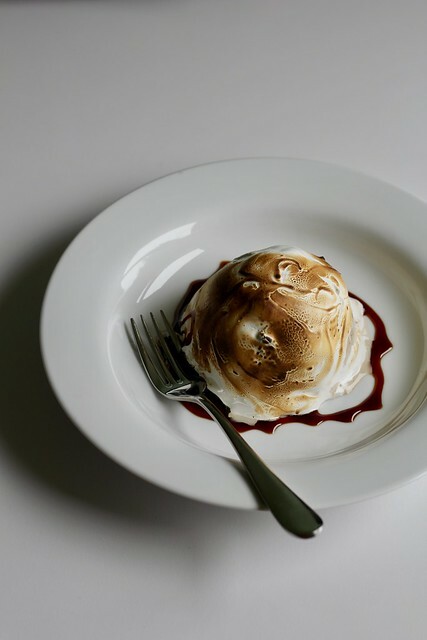 I recently went to a restaurant here at Manly Beach and they actually had a baked Alaska on the dessert menu! I was so excited. They set it alight in front of us, however the alcohol they used (I think ouzo?) was soooo strong I couldn’t taste anything else. So I was glad I had the chance to make this. I never thought of coffee ice cream, that would have been wonderful! Love your mini version. Coffee ice cream sounds like the perfect match to the brownie base. Oh I love the torched look! I couldn’t get mine that brown. I totally agree, what is not to love!